You can find Keith here and here on Ravelry. Your finishing business is a unique twist on making an income from knitting could you tell us how it came to be? Do you have any funny finishing disaster stories that you can share with us? I can’t say I have encountered any disasters, but of course funny occurrences do pop up every once in a while! It’s always fun, for instance, when I receive a sweater with two right fronts! Of course, whenever things like this happen, I always contact my customer so we can decide on the perfect solution. Each item is unique, so when bumps in the road do appear, it is time to get creative. I can say that sweaters have been turned into Afghans and scarves! My aim is to avoid any finishing disasters. For example, I once received a sweater that was knit beautifully. I knew, however, based on the dimensions the sweater was never going to fit the man for whom it was intended. In situations like this, I am always upfront and honest. I would never want an unhappy customer, so I work very hard to catch all potential “disasters” before they have the chance to occur. Your customers say your finishing skills are impeccable, could you share a few tips about how you got so good at finishing? The first knitting store I worked at offered finishing services for their customers, and I learned through hands-on practice how to efficiently seam sweaters and properly pick up stitches. Whenever I teach classes, I always begin by asking my students to think back to when they first learned how to knit. I’ve found that most beginners cast on a few stitches and practice the knit stitch over and over again. At first their knitting is a bit uneven, but as they progress, their knitting becomes increasingly consistent. The same trend applies to finishing, although it is not everyday that one gets to assemble a sweater. I have created specific formulas that clearly lay out all the steps needed to properly seam any garment (as no knitted items are the same), and I give those formulas away when I teach my classes. 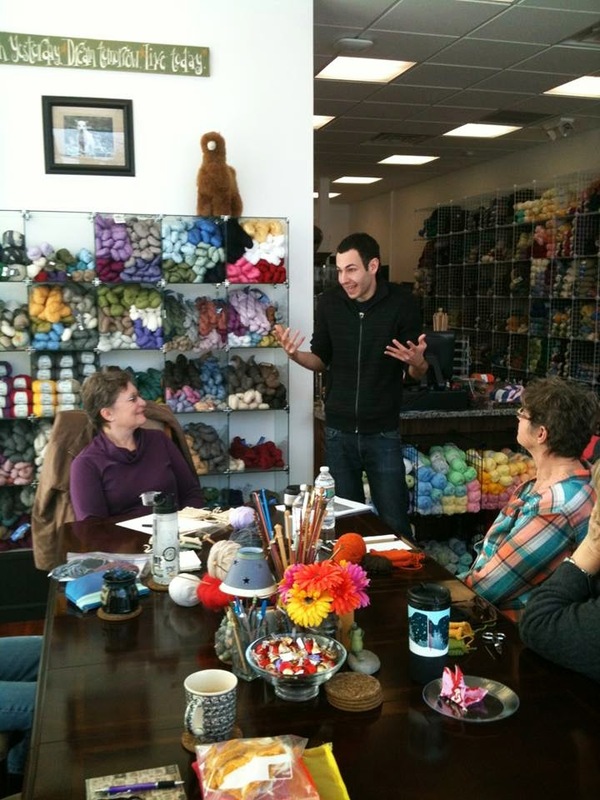 I don’t want to keep any secrets- I would much rather the knitters learn from me! Your other income source is teaching, what level of knitter do you focus on in your classes? Along with knitwear finishing, teaching is a big passion of mine. My “Flawless Finishing” class, targets beginner to intermediate knitters, and has become quite popular. I am high energy and have a very positive outlook, and with my background in English and Special Education, I find that I am able to teach knitting skills to anyone and everyone. I attribute my teaching success to my belief that there are at least ten different ways to teach any given skill, which is so important, since everyone learns differently. When I teach a class, my main goal is to ensure that all students walks away with the “WOW,” factor as they grow as knitters and watch the magic of knitwear finishing unfold. Please tell us a little about your teaching philosophy. A big part of my teaching philosophy comes from all of the special education classes I took when I was obtaining my undergraduate degree. My main motto is that everyone can learn, just in different ways. I make sure to accommodate the needs of all my learners. You also have an exclusive color, line of yarns available for purchase. There is a fund raising component in your yarn sales. Please tell us about the inspiration for this color way and where the donations go. Yes! I am a very open person, and will be upfront and say that I battle with anxiety on a daily basis. The one thing I learned from my battle with anxiety is that you cannot let it control your life. Knitting and knitwear finishing calms me. As for my color, Zen Yarn Garden is one of my favorite yarn companies out there. Both their base yarns and colors are INCREDIBLE, and I was honored when the owners Roxanne and Neville agreed to let me create a custom color for Knits All Done. The color is called “Keep Calm Keith,” and instead of taking a photo of a landscape or flower and turning it into a color, I decided to take the word “anxiety” and turn it into the ultimate blue! The color is a dark black blue. The black represents anxiety, and the vibrant blue represents growth and expansion. I donate 5% of yarn sales to Boston Universities Center for Anxiety and Related Disorders. I discovered this center while researching anxiety on Google, and was amazed by what it does for those who suffer on an extreme level. Your web site is beautifully presented. Did you design it? Thank You! Yes. When I first decided to start Knits All Done, I hired a graphic designer to create a clean and crisp logo (which I wanted to be an accurate representation of the work that I do). As for the website, I got out some HTML books and spent many months learning how to configure the pages. The biggest factor was learning how to incorporate the online web-store into the website. Knits All Done is completely operated by myself, which means I do all the social media, photography, paperwork, and of course the finishing! The website is absolutely due for an upgrade as I have well over 300 beautiful photos of finished items to upload! I did. My formal business plan was typed up on Microsoft word, and included every element of my vision for what I wanted Knits All Done to be. From time to time I still glance at it, just to reflect on all that has been accomplished! Absolutely! I have many! Within the industry, the first person I went to with the idea of Knits All Done was designer and teacher Melissa Leapman, who guided me through the process, and continues to offer the best advice out there. Franklin Habit is another great friend who is always there to provide advice. My Friend Shaina Bilow taught me many of my finishing skills and was a huge support system, as she helped me get Knits All Done off the ground. Other friends have helped along the way, include my dear friend Tara, a fellow knitter who is also Knits All Done’s PR manager, Angela, my editor, and of course Carol, the woman who started it all! While I’m at it, I would also like to thank my favorite English Professor, Professor Golland. Without her, I would not have the writing skills to participate in fun interviews such as this! This is something I am still trying to figure out! I wake up early and go to sleep VERY late. As of right now, I work around the clock. I always make time for friends and family, but to be quite honest, I love what I do so much that it doesn’t even feel like work. I pride myself on my fast turnaround time, and every day I am on the phone talking with knitters around the country so I can help them whenever they need to be helped. I learn from every customer, as I find that every knitter has a different story. In an effort to better maintain an appropriate life/work balance, I plan to start setting stricter work hours for myself. This will be the best way to keep my energy levels high, and maybe even get in some personal knitting time! I am a very positive person, and honestly haven’t come across any criticism thus far. Criticism is exactly what I wanted to avoid when starting my company. I know that the knitting world can be very competitive, and I wanted to create something unique and different that I can call my own, without leaving any room for negativity. With that said, I strive to make ever customer happy and am always welcoming of constructive feedback. At this time I can honestly say that I am fully supporting myself. In late February, I flew to Florida to teach a series of classes at “A Good Yarn Sarasota.” Considering my love for Florida, I felt it was time to make the move to the Sunshine State! During the moving process, I still worked everyday and even brought finishing projects on the airplane with me. Knits All Done now has its own studio in Florida, equipped with 4 blocking boards. The beautiful knits I have been receiving daily here continue to spark my creative energy. I would tell that person to work hard! One of my favorite inspirational phrases is “Keep Moving Forward.” The knitting world is filled with creative energy, so much energy that you really have to push through and invest yourself if you want to succeed. I am a strong believer that every knitter has his or her own specific talent within the knitting world. My advice would be to find it—and share it with the world!